Thread: An old saying . . .
"It is hard to soar with eagles when you work with 's" !!! 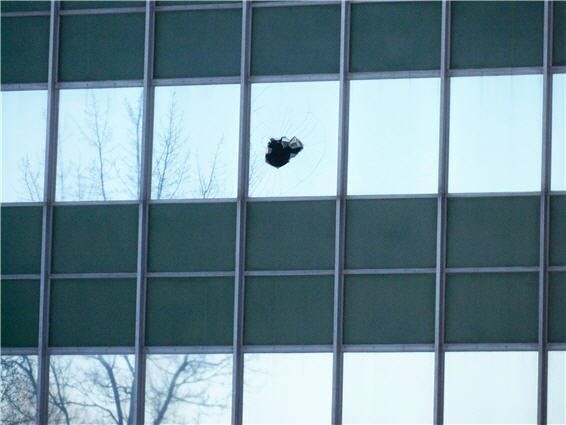 About 6:25 AM yesterday, the turkey above decided to break in to one of the buildings in the complex where I work. (I am actually located across the street but the buildings are connected.) I didn't take the above picture but did take a picture from the outside of the building showing the turkey's entrance. It was the third floor. The turkey was captured and released unharmed. 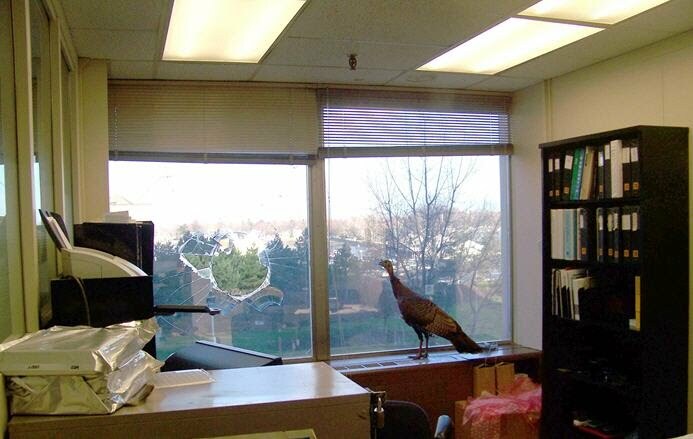 I guess he/she wanted to get an early start on celebrating Earth Day by paying a visit to the corporate world. That is a distinct possibility, James. I thought the saying went "A bird on the desk is worth two in the bush"
That bird looks like someone from the IRS wanting to check the books. That reminds me I got to put my order in for Christmas. What nice photos and what a peculiar story.